From former SNL "Weekend Update" host and legendary stand-up comedian Colin Quinn comes a controversial and laugh-out-loud investigation into cultural and ethnic stereotypes. 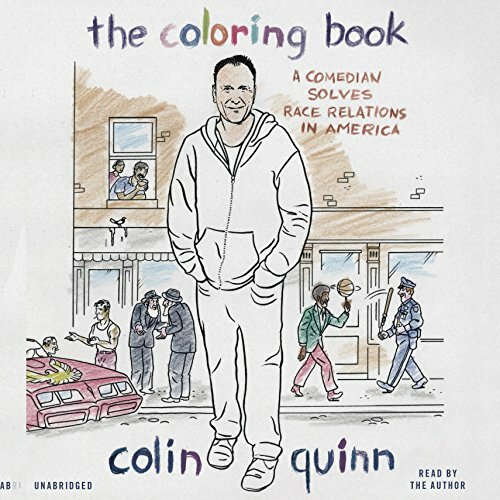 In The Coloring Book, Colin, a native New Yorker, tackles this issue head-on while taking us on a trip through the insane melting pot of 1970s Brooklyn, the many, many dive bars of 1980s Manhattan, the comedy scene of the 1990s, and post-9/11 America. He mixes his incredibly candid and hilarious personal experiences with no-holds-barred observations to definitively decide, at least in his own mind, which stereotypes are funny, which stereotypes are based on truths, which have become totally distorted over time, and which are actually offensive to each group and why. As it pokes holes in the tapestry of fear that has overtaken discussions about race, The Coloring Book serves as an antidote to our paralysis when it comes to laughing at ourselves...and others. I absolutely loved this book. Colin delivered a beautifully written, incisive, hilarious audio-book. So happy he read it because his distinctive speaking voice significantly adds to the experience. It was like hanging out with him without anyone to interrupt. 5 Stars All Around! Only wish it were longer. Colin Quinn is brilliant and this book shows it. If you loved his one man show then you will love this book! Part memoir, part study of New York City and current events without getting overtly political. Colin Quinn really might be the best man in America to have a discussion about race. Collin Quinn is great at telling a story and confronting the truth of cultural relations. I highly recommend this book. it had me laughing from beginning to end. Colin needs to work in his reading skills, but overall this is a great book! Hilarious stories! He manages to be funny and edgy about race without crossing that dreaded PC line. Great job Colin! Mandatory reading for all Generation Gleers. If you look past the terrible book cover, past the god awful book name and actually read this book you will come away extremely happy. The book is funny, it's smart and it's real. Colin is doing the nation a service with this book and I truly feel 88% of our face issues could be solved in just days by making kids in high school read this. Again super enjoyable read - no matter your politics you will love this. Well unless you're a jerkoff. I didn't read the description of this book carefully enough. It really is just a stand-up comedy routine which is not my thing. When it said "a comedian takes on race" I thought it might be 70%, comedy and 30% insight. It was more like 99 and 1. If you like stand up comedy this might be for you. Despite having the grating voice of a 50 year chain smoker gargling with shards of glass, Colin Quinn's (CQ as he prefers to be called affectionately by his dozens of fans) audio performance warms the heart, soothes the soul, and inspires the mind. After listening intently in my car while driving around the ethnic part of town, I really feel like he helped me to "get it" as the hip, in-the-know types refer to understanding PoC (this abbreviation means 'persons of color') and now, thanks to CQ ;) I aspire to meet some Haitians. Colin Quinn is not just a Renaissance Man to me, no. After listening to his charming stories about Chinese work ethic and Jamaicans bedding white women, I feel like he's a Renaissance Friend. When did Colin Quinn get so smart?! This is just a great book that takes you through Collin Quinn's life growing up in New York. It is by no means PC, but it is intelligent, historic and absolutely hilarious. I can't lie, often feels like it's walking the fine line between racism and social commentary, and at times it feels like it's going to fall off the deep end, but I think that's part of the suspense of the book. The first time listening to this I was subconsciously waiting for Quinn to say something horribly offensive so I could go tweet about it, it didn't happen. It was actually a really delightful story about a time in one of the greatest cities of the world that can only be remembered by stories like this. I think it's a great read, it's probably better as an audiobook than as a physical book. I find that the cadence of Quinn's voice is integral to this story and commentary, and I loved every second of it. Listened in a day. We need more commentary and guidance like this in today's world of "never offend anyone "
I do like comedy, comedians, and sometimes I go to comedy clubs. My mother and all her family were from Brooklyn. I grew up in NY. So how could I not enjoy this book by a Brooklyn-born Irish comic? I guess if I had found his misadventures funny, I might have kept listening. But I didn't. I left at the 3 hour mark. Life is too precious for two more hours wasted on this stuff.